Every few generations, there’s a moment in history that signals a turn. It begins with something as imperceptible as a Tunisian fruit-seller who sets fire to himself in a market in 2011, in defiance of the economic injustice he faces; a boat leaving the shores of Libya under darkness to cross into Europe in 2012; the Muslim immigrant living in the ghettos of Paris who reads the poisoned rhetoric of the internet fanatic and believes this is the answer to his isolation; or the election of an American President whose opening act is to impose a ban on Muslims. The direction of history is balanced upon moments like these, seemingly apart, yet, like pieces of the dark night, together they tell the story of our time. The struggle against global jihad is not what ISIS and the xenophobes tell us: a dividing line between East and West, Muslim against Christian or Jew, them versus us. What we’re witnessing is a struggle between the moderate and the fanatic. It is a struggle all of us have a stake in. Right now ISIS is evolving, shifting shape and narrative to survive. It has turned to Plan B, now that Plan A—the Caliphate—has failed. As it faces loss of territory in the Middle East, ISIS enters a new and potentially more dangerous phase in its evolution: exporting its ideology of ‘chaos and savagery’ into new theatres—Europe, Asia, Africa and North America. 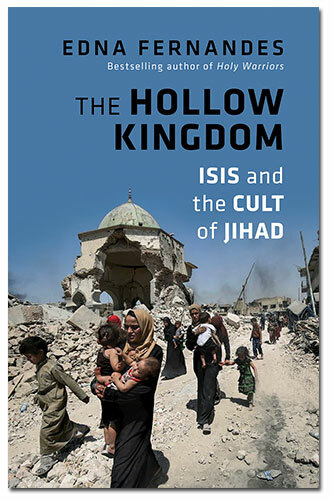 The Hollow Kingdom deconstructs the truth about Islamic State, the greatest terrorist threat of modern times, greater even than Al Qaeda that first set light to a global jihad. It examines the founding ideology and how ISIS evolved; how its recruitment network has given it global reach and how its financial blueprint – exploiting the sale of oil, slavery and mass extortion – aimed to bring in billions of dollars to finance a war without end. By the close of 2017, Coalition forces had pounded the terrorist state into submission. The so-called Caliphate imploded and the truth of its rule was bared. Today as ISIS seeks to take its war and recruiting drive to Asia, Africa and the West, there’s an urgent imperative to dismantle their narrative. For theirs is a siren song. Behind the veil of propaganda about creating an Islamic “land of the pure” lies a desire to forge a global terrorist state built on the enslavement of millions and an economy more rapacious than any dictator; to erase peace and co-existence wherever it lives, until only a wasteland remains. The Hollow Kingdom charts that reality. EF, London, January 2018. Available for interviews on her books. Edna is also available for talks, consultancy, film and writing projects. The struggle against global jihad is not what ISIS and the xenophobes tell us: a dividing line between East and West, Muslim against Christian or Jew, them versus us.